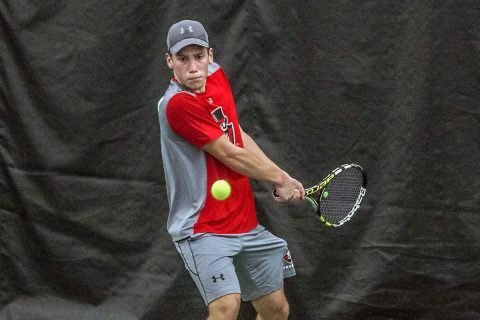 Clarksville, TN – Austin Peay State University men’s tennis team dropped a 5-2 decision, Saturday, against Chattanooga at the Governors Tennis Center. The Mocs (2-2) took the doubles point, winning at #1 and #3 doubles. The Govs (0-2) did win at #2 doubles, but Chattanooga clinched the point shortly after. Almantas Ozelis  got off to a great start for the Govs, winning the first set at #1 singles, but ultimately fell in three sets. Austin Peay picked up wins from Aleh Drobysh  and Jacob Lorino  at #4 and #6 singles, respectively, but Chattanooga clinched the match with wins at #2 and #3 singles. Tiebreakers were the Achilles heel for the Govs, as all three tiebreakers played in the match went in Chattanooga’s favor. Austin Peay is back in action Feb. 3, against Lipscomb, which starts a seven-game road trip for the Govs.